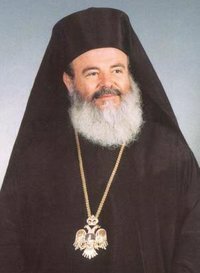 Greece's Orthodox Church leader, Archbishop Christodoulos, has been diagnosed with cancer, doctors said Thursday. The 68-year-old archbishop was hospitalized on June 9 and underwent intestinal surgery. Doctors at the state-run Aretaion hospital said tests showed he has cancer in the large intestine and the liver. The hospital's head doctor described Christodoulos' condition as "treatable," adding that the archbishop had requested that details of his illness be fully disclosed to the public. "He has to deal with a problem. ... But I am hopeful that everything will go well and that he will return to his duties," Health Minister Dimitris Avramopoulos said. Elected Church leader in 1998, Christodoulos received the late Pope John Paul II in 2001, the first pontiff to visit Greece in nearly 1,300 years. Christodoulos followed up last year with an historic visit to the Vatican, where he met Pope Benedict XVI. Despite his popularity, Christodoulos also remains a controversial figure. In 2001, he led a failed campaign to continue identifying religion on compulsory state identity cards. The church maintained it had gathered some 3 million signatures - more than a quarter of Greece's population - in an attempt to force the state to continue the practice. Since being hospitalized, Christodoulos has received daily visits from Greece's political leadership and public figures, including the country's former King Constantine II. On Wednesday, Greek President Karolos Papoulias said after visiting the archbishop that he was "too overcome with emotion" to make any comment. The hospital's head surgeon, Dionysis Vorros, said the two cancers were not directly related and had not spread from one site to the other. "The position and the development of the (cancer) in the liver suggests that it can be dealt with," Vorros said. Doctors said Christodoulos would remain in intensive care for at least three more days and likely be allowed to return home next week.